Home » Countries » Featured Articles » Bulgarian Golf! When planning a golf holiday, I doubt if Bulgaria is the first country that springs to mind. But it might be soon! If I’m honest, I was expecting Bulgaria to be full of old ladies in black, wearing socks and scarves. But I was wrong. It’s perfectly normal and European. Golf is a new sport in Bulgaria. In less than 10 years, more than 10 clubs have opened. But it’s still only played by the Upper Classes. I recently went on a golf trip there, visiting four clubs. Excuse my lack of enthusiasm. I don’t care for golf. Been there, done that, didn’t like it very much. St Sophia Golf Club and Spa was the first. Kindly giving up my place to one of the men, I passed the time in the spa, relaxing in the steam room, pool and jacuzzi. Oh the things I do for my job! I had a bit of a sore throat and a slight sniffle, and I was worried that I was going down with something. Within 10 minutes in the steam room, I felt the exact moment when it lifted! Who needs medication? 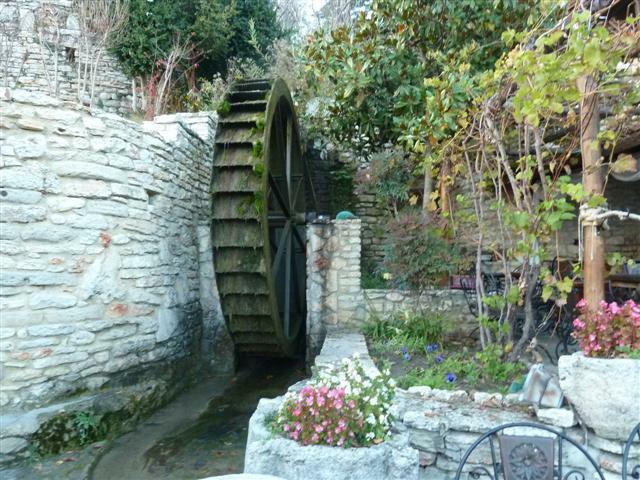 Bulgaria is 2nd to Iceland for minerals, with hot springs and spas everywhere. The bar and restaurant is quite stunning. All the staff wear salmon-pink jumpers. If you go there to play, do take some treats for the furry, four-legged caddy that trots along behind all the golfers! There are a lot of stray cats and dogs everywhere in Bulgaria, but they all look quite healthy. And the Bulgarians stop to bend down and pat them. We drove to our next destination, past miles of empty farmland and abandoned factories, frozen in time. It looks as though Aliens arrived about 40 years ago and snatched up most of the inhabitants! The population used to be around 9 million. Now it’s closer to 7 1/2. Why? It used to be common to have as many as 13 children. Now the maximum is two, and any more is virtually unknown. And the younger ones often go abroad to work, now that they don’t need a passport thanks to the EU, usually returning after several years, when they’ve saved enough money. We stayed at the Pravets Golf Club. Its main office is in St Andrews, Scotland. The views of the lake and mountains are striking. Designed by Peter Harradine, the par-three eighth hole is the signature hole, with an island green over a bridge. Again I nobly gave up my place and relaxed in the pool and spa. Lovely! The restaurant was a buffet, with a wide range of food. We were spoilt for choice. I met Hristo Stoichkov, one of Bulgaria’s most legendary football players, and had my photo taken with him. Like a lot of footballers he plays golf to keep fit. Off we drove again through miles of unpeopled countryside, although many different breeds of migrating birds stop there twice a year. Hardly any cars passed us. I’d love to get my hands on one of the ruined farmhouses, to renovate it and relax there! We arrived at the newly-built 5-star Lighthouse Golf & Spa Resort. It opened in September 2008. The course is designed by the ex-Ryder Club Captain, Ian Woosnam. It’s a very challenging course. No, I’m joking. The hotel is very light and luxurious. It also has conference rooms, a piano bar, a casino – and a smoking bar. The views of the Black Sea from the balcony are beautiful. Imagine having a luxurious spa and pool all to yourself. I did. Absolute decadence! 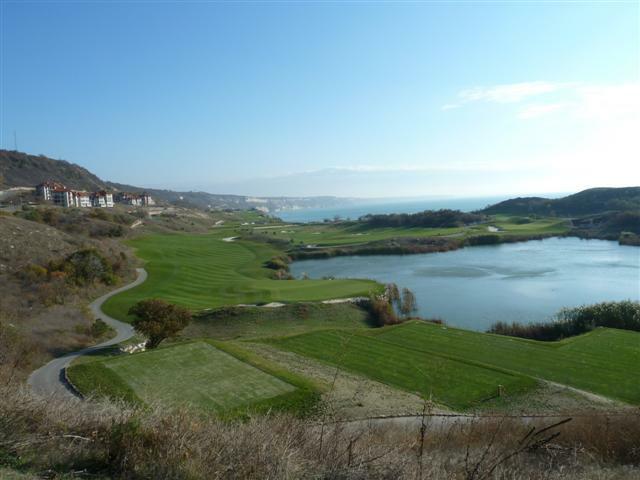 Our final visit was to the Thracian Cliffs Golf and Beach Resort. Designed by Gary Player, it snakes along the cliffs for 4.5kms. When we spotted it, we practically fell out of the minibus to take photos. It’s absolutely stunning! 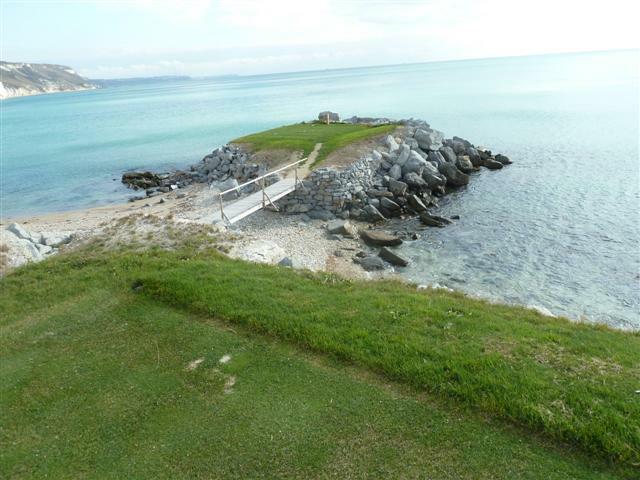 Unlike the other courses, Thracian Cliffs doesn’t have a hotel. It has a selection of apartments for sale, with shops, a spa, and other facilities. There is also a private beach below the cliffs. The 2013 Volvo World Match Play Championship was held there from the 16th-19th May. Spectators had excellent views from above. And over 1.5 billion people watched it on tv. This time, I went round the course as I wanted to see it. We rode in golf buggies as it’s impossible to walk it. I rode with Vesselin, the Coach. I didn’t trust any of the others, going downhill towards the edge of a cliff! It takes around six hours to play the course as everyone keeps stopping to take loads of photos. It really is funny, seeing someone take ages to get in position, then whacking the ball straight into the sea! Okay, I admit it. I just had to have a go. Vesselin stood behind me and showed me how to get into position and swing. Um, would you mind showing me that again, please, Vesselin? And just once more. Honestly, I hit the ball straight towards the hole. The men didn’t say Well done, or anything like that. They just muttered jealously. After all I’d sacrificed for them! We had a delicious lunch in the restaurant. The chef is Bulgarian, trained in Monaco. 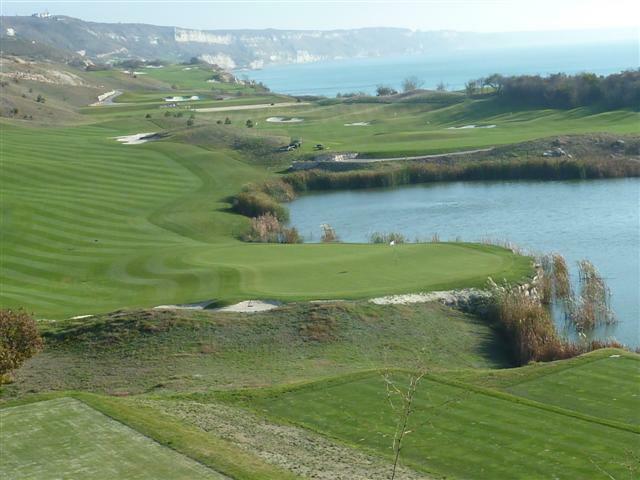 Gary Player described the Thracian Cliffs as the most beautiful golf course in the world. I think he’s probably right. Thracian Cliffs has just been awarded The Best Golf Resort in Europe for 2014. As I said, I’m a non-golfer, but I can see why!